In the foyer, Hunt Slonem’s painting, “Lories, 2000,” offers a contemporary contrast to a William IV center table. 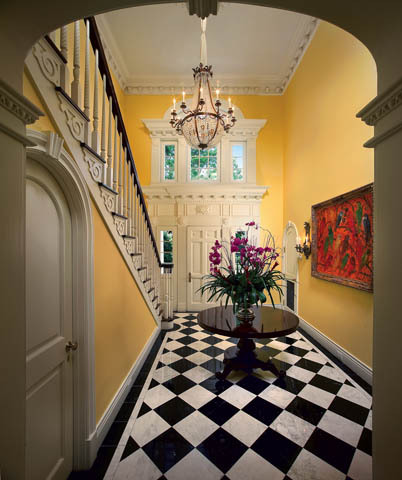 Most of the millwork, including the scrolled detailing along the base of the stairway and the Palladian-style transom, was added in a previous renovation. 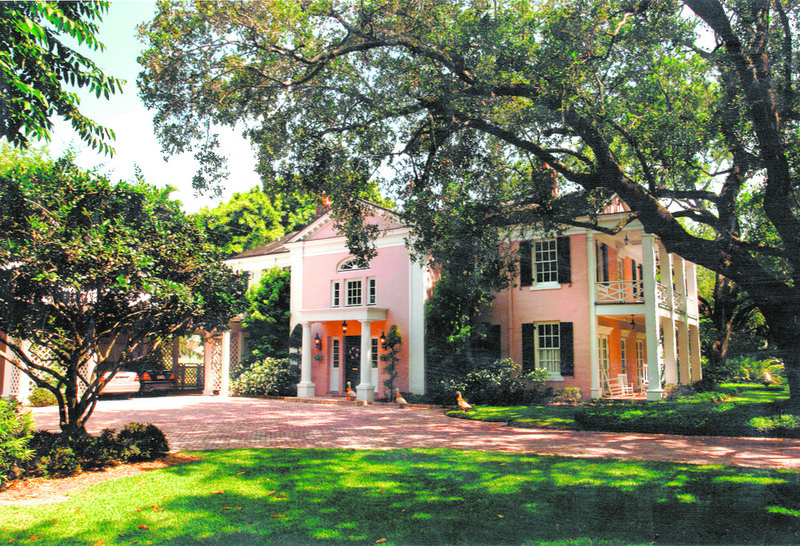 This stunning home (which I have dubbed the “pink palace”) is located just south of downtown Miami in beautiful Coral Gables, or simply “The Gables” as it’s known to natives. 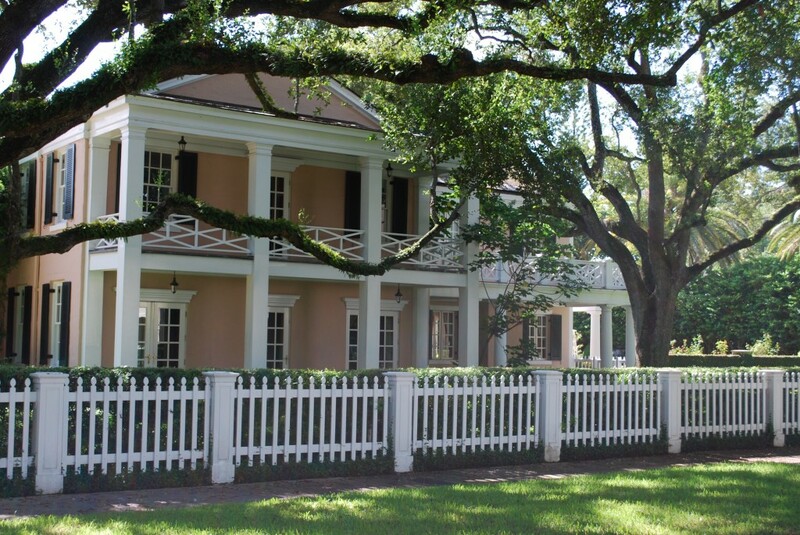 Also known as the “City Beautiful,” The Gables is known for its lush green avenues beautiful landscaping, exceptional architecture and historic homes, such as this masterpiece. 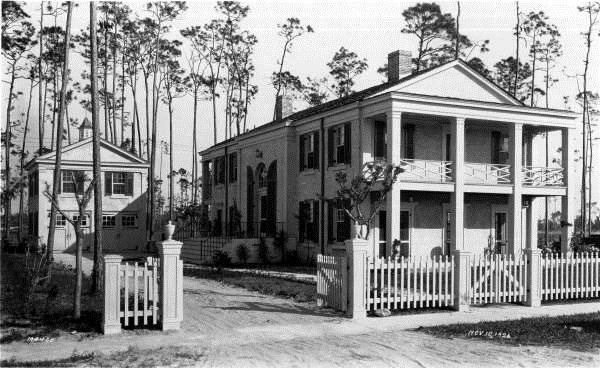 The “pink palace” is located on one of the most beautiful of all the beautiful streets in The Gables, overlooking the Riviera Golf Club. It features a rose garden and formal terrace with a fountain and adjoining carriage house. 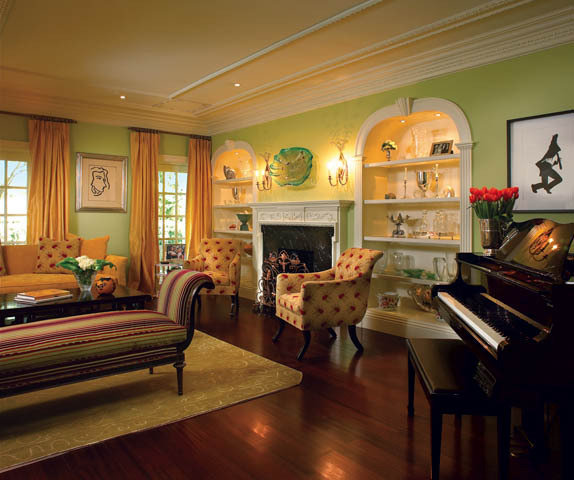 But, most importantly, it features some of the most beautifully decorated rooms I have ever laid eyes upon, designed by Miami-based interior designer Bob Biederman. 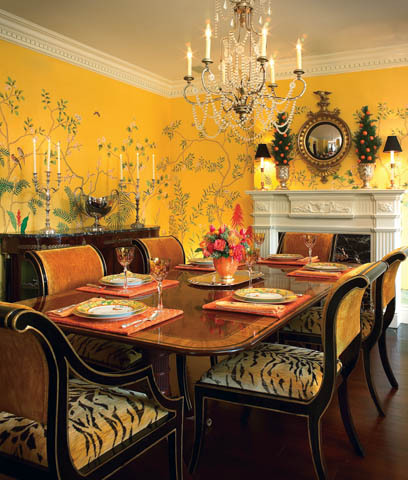 The exquisite dining room features a spirited mix of patterns and textures including silk De Gournay wall coverings and Empire-style, black-lacquered chairs covered in Clarence House tiger-print velvet. Just across the hallway, a coordinating palette of burgundy and gold, against mint-green walls, prevails in the spacious living room. “The inspiration originated from the burgundy and green silk we chose for the Nancy Corzine recamier, which we then custom-matched to the wall paint,” Biederman says. In addition to the recamier, a sofa and chairs from Rose Tarlow form a conversation grouping near cabinetry that displays objets d’art. Artwork from the owners’ collection includes Henri Matisse’s 1948 “Nadia Regardant á Droite;” Robert Longo’s “Male Dancer,” shown near the piano, and “Female Dancer;” and art glass by Chris Hawthorne on the wall above the fireplace. 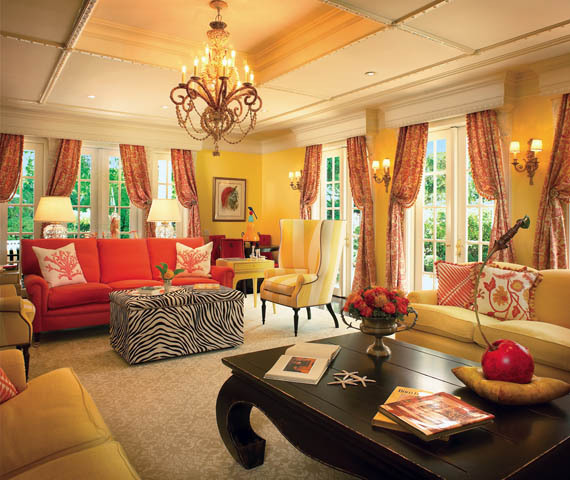 Vibrant hues come together in the family room with a Jacobean floral print drapery fabric and coral and yellow sofas and accent pillows. Unexpected touches, such as a seashell-encrusted chandelier and zebra-print storage ottoman add a dose of whimsy. The mix of colors and patterns – coral fabric from Bergamo, yellow fabric from Castel, zebra print from Kravet and Grey Watkins fabric on a Victoria Hagan wing chair – gives the family room a collected look. 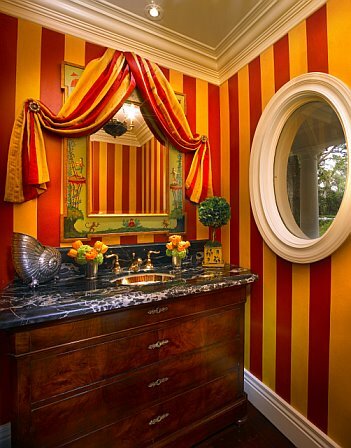 Biederman purchased this colorful circus stripe fabric and then had a faux painter duplicate the stripe on the walls. 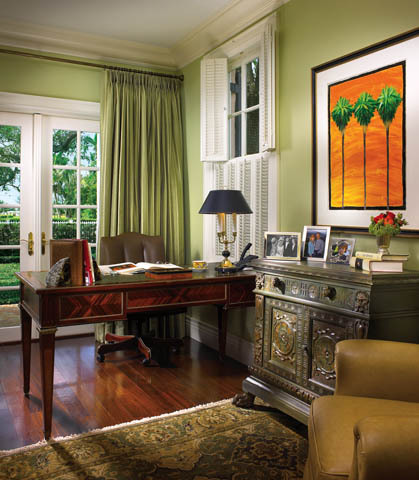 In the husband’s office, a calming hue of green swathes the walls, where a Louis XVI writing table from France, circa 1925, serves as a desk. The oil painting is by Maria Reyes Jones. 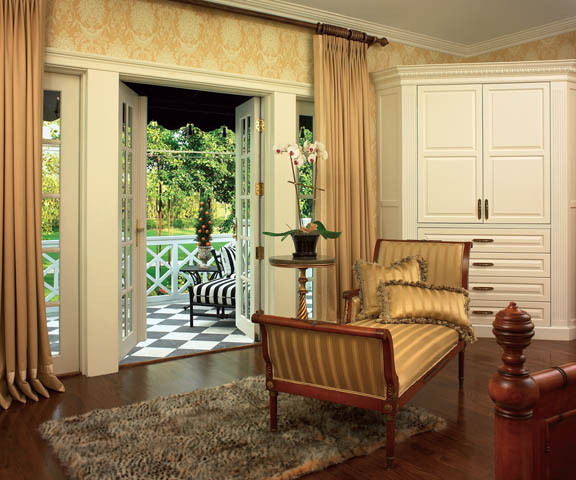 The yellow silk-upholstered walls in the wife’s study pose an elegant milieu for a collection of MacKenzie-Childs furniture. A George Smith love seat in a Pierre Frey striped fabric is nestled in the corner… with a fabulous Hermes orange Birkin perched on top. Serenity prevails in the master suite with a gray-blue and camel color scheme, providing a traditional and soothing feel. Biederman chose luxurious fabrics in tone-on-tone camel patterns. A hand-loomed area rug defines the Louis J. Solomon bed and Rose Tarlow bedside table. A fur area rug sits beneath an antique recamier in the master suite. Across from the bed, French doors open to a terrace that spans the master suite and the adjacent guestroom. In the guestroom, the juxtaposition of contemporary art with antiques and newer pieces gives tradition a playful tone. “Our objective was to retain a sophisticated look that respected the home’s heritage, yet was lighthearted and fun,” Biederman says. And that concludes our tour. Oh, I do wish I had more pictures! I love how Mr.Biederman paid homage to the traditional roots of the home’s architecture and the era in which it was built, yet he infused a fresh, whimsical and playful twist, perfect for a modern family. I am wild about the unexpected mix of animal prints, patterns, colors, antiques and accessories, along with how each room gracefully flows from one to the next with masterful coordination. our lives.” – Bob Biederman. Great house, great designer in Bob Biederman. Thanks for showcasing this home.